Beatriz Cardona comes from an entrepreneurial family. 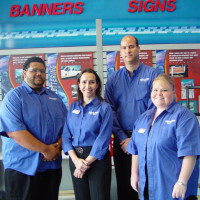 Following her dreams, she and her husband, Roberto, opened a Sign-a-Rama franchise in 2010. Three years later, on September 4, their hard work and persistence paid off as Beatriz and Roberto were recognized for their impressive growth during the 27th Annual Pasco Economic Development Council’s Awards Banquet. Sign-a-Rama of New Tampa received the 2013 Manufacturing Industry of the Year Award. In 2012, they purchased one of their suppliers, increasing their capacity of sign manufacturing and diversifying their customer base. Signs of Tampa Bay, LLC – parent company to Sign-a-Rama of New Tampa – nearly tripled sales in 2013 with a team of 15 dedicated employees. “I had very specific questions in regards to structuring my company in the areas of business taxes, payroll responsibilities, marketing and financing,” Beatriz said during her first visit to the Florida SBDC in 2010. In 2011, Beatriz once again reached out to the FSBDC at USF to learn more about becoming a certified business entity. With the assistance of FSBDC professionally certified business consultants, the company became certified by the State of Florida, adding another tool to the business’ marketing tool kit. Beatriz says they recognize there are government contracting opportunities available to them and they are doing everything possible to successfully participate. With the purchase of the manufacturing supplier in 2012, Signs of Tampa Bay doubled in size and positioned the business to triple its sales. This side of the business provides sign manufacturing and wholesale services to other trades. Once again, the FSBDC supported the couple’s efforts and guided them in securing a Small Business Administration (SBA) loan for the purchase of equipment and real estate. Now, Signs of Tampa Bay operates from close to 9,000 square feet of owned and leased space in Wesley Chapel and Lutz. Roberto manages the wholesale manufacturing operation, allowing Beatriz to concentrate on the Sign-a-Rama franchise and its retail sales. Beatriz explains that the FSBDC’s expertise and experience guides small business owners throughout every step of business. They say they will continue to seek support from the FSBDC at USF to strengthen the longevity of their business through more advanced consulting. "Most people aren't familiar with every aspect associated with operating a new business or growing an existing one, but the FSBDC was able to provide this expertise at no cost."